Finally a moment to myself. 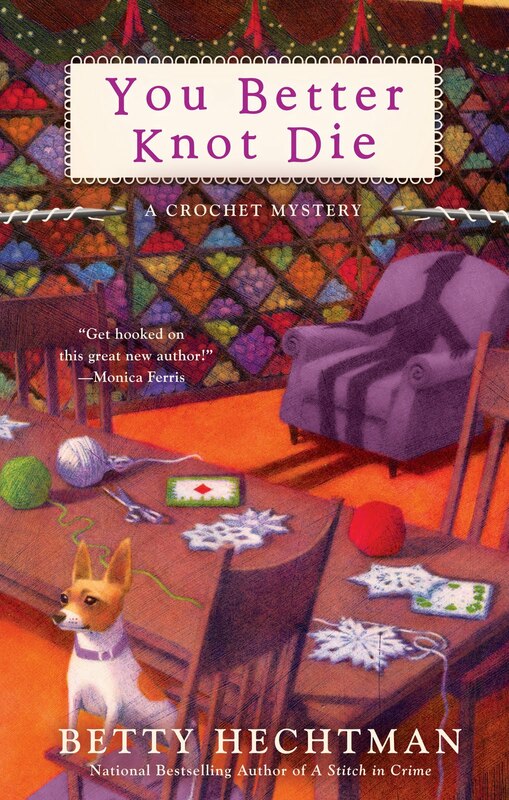 My name is Molly Pink and I’ve been locked up with my author for what seems like forever, but was more like two weeks while we went over the copy edit of You Better Knot Die. If she asked me one more time if I was really sure I wanted to say something, I was going to scream. At last I can kick back and spend some time crocheting. I know I admitted to being a yarnaholic, but that might have been a little extreme. Everyone in my crochet group, the Tarzana Hookers, has a little too much yarn. Too much means you’re keeping it in the Joann’s bags because you’ve run out a shelf space and unless you get some more plastic bins there’s no place else to keep it. Here’s the problem. It takes much longer to make something out of the yarn than it does to buy it. BTW the reason my author keeps writing about me is that I keep getting involved with dead bodies. Maybe involved is the wrong way to put it. It’s more like I end up investigating how they got that way. I don’t know how my late husband Charlie would feel about my sleuthing activities, but if he could see me now, he’d be happy to see that I started a whole new chapter in my life when I got the job as community relations/event coordinator at Shedd & Royal Books and More in Tarzana, California. He’d approve of the bunch of new friends I’ve made since I joined the crochet group that meets at the bookstore. Okay, maybe he wouldn’t be that happy about the men in my life. Barry Greenberg is a homicide detective who thinks we should get married. And Mason Fields is a high profile attorney - think keeping naughty celebrities out of jail - who just wants to have fun. My author keeps telling people that there are dead bodies in my adventures, but everybody has a good time. hi Molly, it's nice to meet you. I'm ready to read your next adventure! Hello Molly, glad to meet you. Sounds like you've been up to some interesting stuff. As a fellow yarnaholic, I love spending time with you, Molly. My own characters are all useless at crafts. Hello, Molly! So nice to meet you. By the way, I just love your name and the name of your crochet group! I hope you and I have a chance to meet some day because I'd love to learn how to crochet. I tried it once when I was very young, but I couldn't get the hang of it. Good to see that someone who sounds normal is writing on this blog today. I'm a quilter, so I love fabric like you love yarn. And we seem to have dead bodies in common, too. What's with that, anyway? How nice to find a group of new friends after someone so dear has left your life. Good for you, Molly. I want to learn how to crochet--does Molly give lessons? And I'm a total yarnaholic, too, despite my crafty shortcomings. Hey Molly - I wonder if we could get the Tarzana Hookers and the Dalliance Fat Quarters together? Just imagine the lovely things they could create! Your new job sounds wonderful! Hi Molly - It's nice to meet you. I'm a yarnaholica too. I'm willing to admit it, but I'm not looking for a cure. Thanks for all the welcomes. It's nice to find out I'm not alone in my yarnaholicism. Too bad I can't show you the big bag of handdyed yarn I got from the Tuesday Morning store. When it's gone, it gone from there, so I had to stock up. Hi Molly - My grandmother was a whiz at crocheting and knitting and weaving and sewing. One wall of her Loom Room was a floor to ceiling set of oak in-boxes (no idea where she got them). Each box -- about 4 inches high, 7 inches wide and 18 inches deep -- was filled with yarn. As kids we loved to look in the boxes just to see all the pretty colors :) Good luck with your book! Laura, your grandmother's loom room sounds like heaven. Nice to meet you Molly. i am crafts impaired, so it is unlikely that I will ever meet you at a craft, needle, yarn or fabric shop. But I do look forward to reading your stories. I'm a fan, Molly, and I totally relate. I'm a fabriholic *and* a yarnaholic. It's sad, really. Molly, do you really honestly believe that you can have too much yarn??? Even though I'm a (*gasp*) knitter, and can basically only crochet a simple chain stitch, I salute your yarn addiction! Molly love your books. You are quite a detective. Can't wait for You better Knot Die.